It occurred to me after I moved this blog to the new URL that some new readers might arrive here without the context that some who followed the old version of the blog might have. One big chunk of that context is my photography – the thing that often takes me to the places I write about here. While I did travel to Yosemite last weekend largely to see and experience the transition from winter to spring in the Sierra, making photographs is a very important part of such trips. 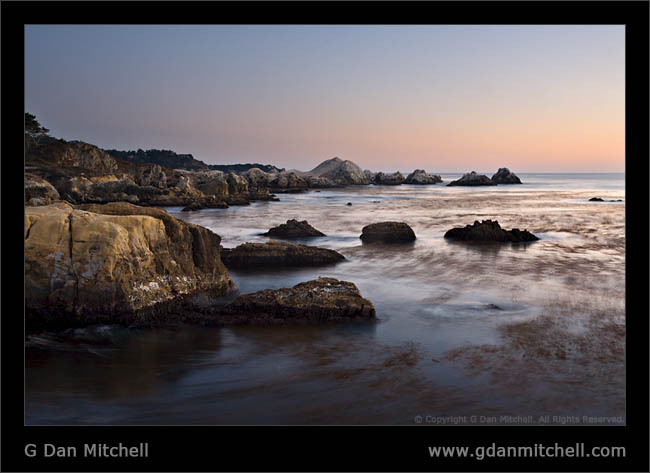 I don’t post them all here, but I do post a new photograph every day at my photography blog: G Dan Mitchell Photography. Additional photographs from opening day along Tioga Pass Road are already posted there, with more to come from TP Road and Yosemite Valley. According to a post at Yosemite blog, the weather service is forecasting that high levels of spring runoff water in the Merced River may cause some flooding in Yosemite Valley this weekend. Before you panic, a bit of flooding in wet years is a normal thing and is part of the natural life cycle of meadows there. And, if you are a photographer, this can provide some very special photographic opportunities. As for me, no camping this weekend. In previous years I’ve joined some friends for a “Goodbye Winter, Hello Summer” traditional visit to Mammoth for desert camping and late-season telemark skiing. However, this year I’m just a bit too busy with other things, and I’ll likely be staying closer to home. Read Tom’s Post for details and links to more information. The short story is that you have lots of options if you live in certain areas north of the Golden Gate. You have limited options if you live elsewhere in the Bay Area, but some of them do seem pretty interesting. His report on Mt. Diablo, for example, is intriguing. I’ve often considered heading to New Almaden Quicksilver County Park on a VTA but have never quite gotten around to it – something about schlepping my typical Big Bag o’ Camera Gear through city streets and on the bus perhaps? May 1, 2009 Posted by gdanmitchell | Commentary, News, Trails	| accessible, almaden, bay area, blog, county, diablo, drive, mount, mt, park, quicksilver, san francisco, santa clara, tom mangan, Trails, transit, two-heel, valley transit authority, vta | Comments Off on Take Transit to Trails? The Glacier Point Road tentatively may open on Friday, May 1, conditions permitting. The Mariposa Grove Road tentatively may open on Friday, April 17, conditions permitting. April 21, 2009 Posted by gdanmitchell | Commentary, News, Sierra Nevada	| conditions, date, estimate, fish taco, glacier point, grove, guess, historical, latte da, lee vining, maripose, may, mono lake, national park, opening, plow, road, tioga, Yosemite | Comments Off on Waiting for Sierra Summer? I virtually never buy gas there anyway, but this is good to keep in mind if you aren’t one to watch the gas gauge carefully. Since I most often come in from the west side I usually tank up in Oakdale or possibly near Groveland on the way up – prices are a lot lower there than inside the park. If I’m coming up from the east side I usually try to get gas in Bishop – again, considerably lower prices here – or possibly Mammoth if I have a reason to go up there. Edie Howe’s Little Red Tent blog, that is. Edie lives in Yosemite Valley and often posts her photographs at her site and elsewhere. Recently she did the Four Mile Trail (from the Valley to Glacier Point) and she has posted a sequence of photographs from the hike. For everyone who wondered whether the smoke from California wild fires has gotten into the Valley, here is a partial answer. Point Lobos State Reserve (part of the California State Parks System) is one of the best places in central California to enjoy the Pacific coast. This rocky shoreline features great vistas and wildlife including otters, sea lions and seals, and tons of birds. There have been two downsides:Being only a few miles south of the tourist mecca of Carmel it can be quite crowded, and closing time has always been way before sunset – at one of the best places in the state to watch the sun set over the Pacific. This summer the park system fixed one of those problems, and in doing so reduced the other. The change is that the park now closes 30 minutes after sunset. (This may change after the peak tourist season, so contact the park to make sure that this policy is still in effect before visiting.) Yesterday I went there to photograph the evening light – the park listed sunset as 7:15 so I was able to stay until nearly 7:45. It was a nearly completely calm evening, with low surf and almost no wind. The “golden hour” light was beautiful, occasionally illuminating wispy clouds of fog. Dusk, Point Lobos State Reserve. Monterey Peninsula, California. September 15, 2007. © Copyright G Dan Mitchell. Surprisingly, there was almost no one in the park at this most beautiful time of day – quite a contrast with a typical weekend during the day, when the park can be so full that all the parking spaces are taken and cars are queued up at the entrance waiting to get in. There seemed to be a small number of people waiting for the sunset, but most of them left around 7:15 as the sun dropped below the horizon. Extraordinary light continued, and perhaps even improved, for another 20 minutes or so – but I don’t think that there could have been more than a dozen people left by then. Tom Mangan continues to post interesting stories about the Lick Fire. Today he links to an article about people who have property in the area, and he includes a link to a slide show featuring some very good photographic work by Patrick Tehan. Lick Fire Bosses Gain Ground. Lick Fire Incident Commander Bob Whallen, his command team and the 1,900 firefighters assigned to the incident have turned a corner. The weather helped as humidity and winds worked to their favor. Follow the link for the full post, which includes a summary of some interesting facts about the fire: Total area projected to be close to 50,000 acres and total cost of fighting the fire to be about $10 million. Or $4.8 million if you believe SF Gate.